FREDERICTON -- Just like their meeting two weeks ago in Wolfville in the last weekend of the regular season, it was the University of New Brunswick Varsity Reds skating away with a 4-0 win Saturday night over the Acadia Axemen to take the first game of their best-of-five AUS semi-final series. UNB goaltender Travis Fullerton (Riverview, NB) gets his second consecutive shutout against the Axemen, but his strong game was overshadowed by the return of defenceman Ben Shutron (Orleans, ON) to the V-Reds lineup. Shutron, an AUS Rookie All-Star and CIS All-Canadian Rookie last season, broke his right femur in an exhibition game September 18 against the Calgary Dinos and was expected to miss the entire season. But six months later he has rehabbed ahead of schedule, and with Jonathan Harty (Oromocto, NB) sick and out of the UNB lineup, the opportunity arose for Shutron to test himself in a game and he came away with flying colours, including a point shot off the Acadia net in the second period. The game itself got off to big of a tentative start, with UNB a bit rusty after a two-week first round playoff bye break, and the Axemen fresh from sweeping the Panthers last weekend. Acadia goaltender Kris Westblom (Meadow Lake, SK) was coming off back-to-back shutouts against UPEI, and he stopped all nine UNB shots in the first period. Fullerton only had to deal with three shots on goal. The banged up Axemen lost another key player in the period, when Chris Bruton (Calgary, AB) hit the boards awkwardly trying to avoid a check and had to leave the game. Bruton didn't return as he went to the nearby D. E. Chalmers Hospital with an apparent shoulder injury. The second period saw the V-Reds up the tempo and pretty much control the early play. 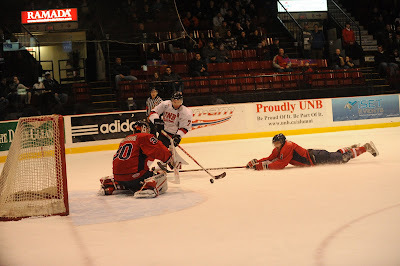 Well until Jacob Dietrich came roaring down the left side and rookie UNB defenceman Marc-Antoine Desnoyers (Hippolyte, PQ) tripped him up as he broke towards the V-Reds net. UNB had an aggressive penalty kill going when Hunter Tremblay (Timmins, ON) stole the puck and went the length of the ice with Chris Culligan (Howie Center, NS) on a two-on-one break. Tremblay passed cross-ice to Culligan who went in on the net only to see Westblom poke-check the puck away from him in the blue paint. However Acadia defenceman Michael Ward (Shippagan, NB) was unable to clear the loose puck and Culligan picked up his rebound and fired it over a sprawling Westblom at 5:28. UNB extended their lead a few minutes later when Kyle Bailey (Ponoka, AB) was foiled by Westblom on the rush, but a pinching Desnoyer was able to pick up the garbage goal when he tapped in the rebound. UNB kept up the pressure and the energy line added to the tally when defenceman Bretton Stamler (Edmonton, AB) carried the puck deep into the Acadia zone and Spencer Corcoran (Summerside, PEI) saw his shot through a crowd catch the inside of the far post at 12:52. Three minutes later it was the UNB power play going to work, and seconds after their five-on-three became a one-man advantage Culligan missed a high rebound but Bailey connected with the shaft of his stick to make it 4-0. UNB outshot Acadia 14-4 in the middle period. 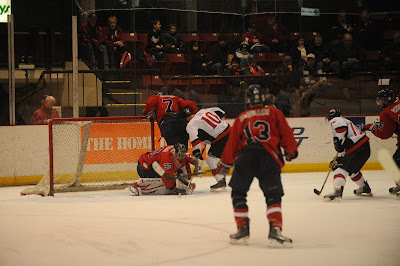 The Axemen had a five-on-three power play continue into the third period, but came up short. UNB helped out by taking another penalty, but Acadia's second two-man advantage was brief as they took a penalty of their own. The visitors had yet another five-on-three later in the period, but Fullerton made some key saves to stop any comeback chance. Acadia outshot UNB 8-7 in the final period, but outside of the power play opportunities it was the home team controlling the play. 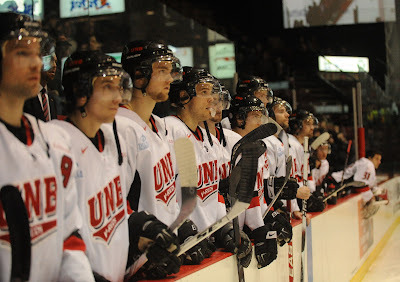 The final shots in the game were 30-15 in favour of UNB. On the other side of the rink UNB coach Gardiner MacDougall thought his team's “game action” was a little off due to the two week layoff, but he was pleased with how the V-Reds responded. “We have to get up to the intensity level of our opponent as quickly as possible.” MacDougall wasn't as pleased with UNB's team discipline, particularly in the offensive zone, but he said, “The penalty kill was the best part of our game.” Regarding Ben Shutron's amazing comeback MacDougall pointed out “what is says about the human mind and the determination of the human spirit and a positive attitude.” The coach was particularly effusive in his praise of the UNB training staff who worked tirelessly with Shutron during his rebab. The two teams return to the ice at the Aitken University Centre Sunday at 6:00 pm. Game Notes: The paid attendance was 1511 ... The game stars were: 1. Kyle Bailey 2. Hunter Tremblay 3. Bretton Stammler ... UNB was 1-for-4 on the power play while Acadia was 0-for-6 ... Along with Harty's illness, Lachlan MacIntosh was scratched from the UNB lineup with an upper body injury ... Acadia's injured scratches were defencemen Zack Firlotte, James Klie, Beau Prokopetz, and Graham Bona and forwards Ryan Graham and Jonathan Laberge.